Where can you learn voguish saree draping ideas, mind-blowing blouse necks and other interesting ethnic fashion hacks to try? If you love to keep a tab on where the Indian fashion is treading at present, you should not miss out fashion shows. Especially if the show is all about hand woven fashion, then you have all the more reason to know about it. Because as we already mentioned, this is where, you can get inspiration for your wearable ethnic fashion. Woven 2017, a fashion show, to support weavers held few days back, where prominent south celebs walked the ramp to show their support. 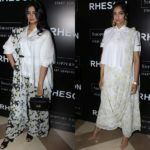 So we got to see our south style icons giving fashionable spin to down-to-earth handloom clothes. From simple sarees to chic maxi, the ramp was graced by fine looking models donning the perfect hand woven ensembles. Here below you can find what the lead ladies worn for the event. Samantha looked regal on a monochrome ikat saree with long black jacket. Defined waistline and shoulder touching long silver earrings finished off her style. 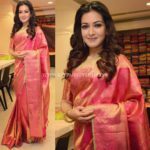 Catherine’s saree mostly resembled samantha’s one but she did went for a different draping style which made world of difference. Also, the fine hair bun and dark eyes did their best to make her look gorgeous. 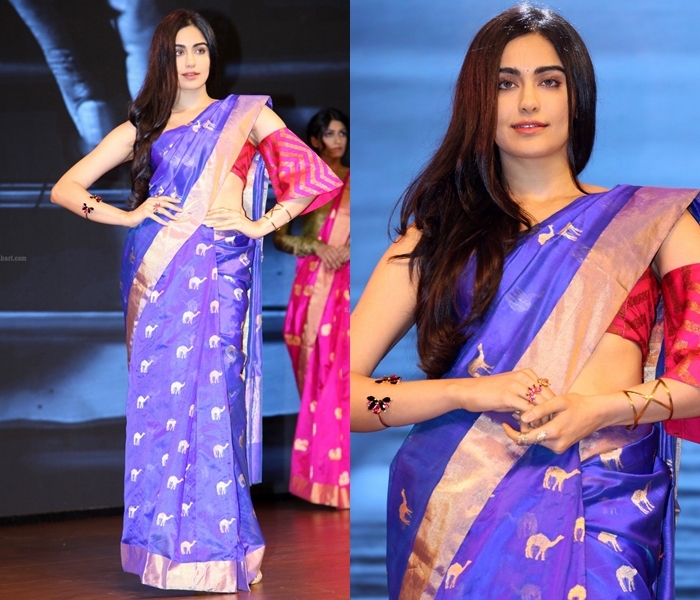 Here below is Adah Sharma wearing the most sought after animal printed saree of this season with trendy one shoulder blouse. 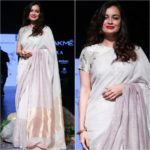 These are few of the saree style which we loved on the show. To catch the pictures of the entire show, do check here. Next articleWhat Lipstick to Wear With Green Saree?